Scott Mueller's Upgrading and Repairing PCs Forum • View topic - Can a LAN card cause internet speed problems using ADSL? Can a LAN card cause internet speed problems using ADSL? Post subject: Can a LAN card cause internet speed problems using ADSL? I have a strange problem regarding my internet download speed. I have contacted my ISP and they have made several adjustments. After doing this and re-booting the modem, The speed is about what it should be , around 14Mbps. Then, after a while, if I turn off my computer, or even leave it on for a while then come back, the speed drops. My ISP tech support recommended I upgrade the modems firmware. Before I do this and,as an experiment, I connected my laptop to the modem and the speed was very fast, and at the right speed, but my desktop is going really slow again. I am wondering if it could be the LAN card I have in my desktop (10/100Mbpsf ast ethernet ) that may have something to do with this. I also thought it could be a driver issue with this card. I am using Windows XP home SP3. My modem is a Netgear DG843GV. I would really appreciate any help with this. Thank you. Post subject: Re: Can a LAN card cause internet speed problems using ADSL? Without knowing anything specific about your ISP, your plan (provisioned speeds), how you are measuring the speeds, what the speed apparently drops to, your modem/router, etc. I'm going to say this behavior sounds pretty much normal. You could try changing to a different LAN card (and a different cable), but I doubt that will make any difference. The truth is there are many different factors that determine what speeds you might see on a specific system, and depending on these factors speeds can vary by quite a bit, even on the same system. Scott. I am using the ISP's download speed test . 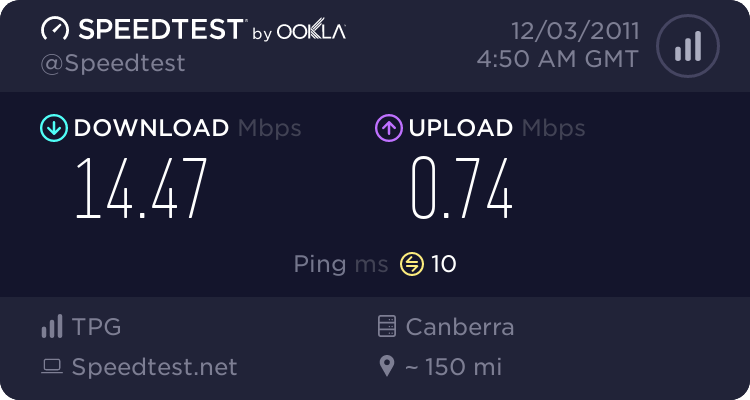 http://www.tpg.com.au/downloads/ I am now getting a transfer rate of between 1.54-1.75Mbps where before I was getting around 737kbps. This however can drop back to the lower speed at any time without warning on my desktop, but if I connect my laptop to the same modem I will get a consistent high speeed. On my netgear modem I am getting a DownStream Connection Speed of 19684 kbps and an UpStream Connection Speed of 900 kbps . Note that slower systems often benchmark at lower speeds due to excessive software overhead or Windows "rot", in which case a reload may help. Scott. Its not the fastest, but considering I was only getting 4.9Mbps before, its a big improvement. Thanks also for the advice about doing a re-load.